A message on Whatsapp on a normal Friday evening. An invitation for a new bus launch even in Trivandrum. That was an invitation I couldn't refuse. I was in a quandry - I was supposed to attend a training program in Mysore starting that Monday. However, I wasn't yet confirmed for the Mysore event. On Saturday, I received a confirmation that I should be going to Mysore for the program. Soon after the confirmation came, I called up Friends Travels Madiwala and asked for the status of Trivandrum buses that evening - I was told that all of them were available. I did not block a seat and decided to walk in to Friends travels that evening. The paperwork for the training program that I had to attend in Mysore was taking up a lot of time - it was almost 1730hrs by the time I left home. I had to hurry once I was at home - packed my baggage, got fresh and had my dinner. My brother dropped me at Madiwala - I was in Madiwala to board a bus after a really long time. The last time I took a bus from Madiwala was in February! I had been either driving down since, or had been taking government buses. Boarding in Madiwala has turned messy ever since the defunct fuel station in Madiwala was demolished and the site closed for construction. All the buses spill over to the road and traffic becomes a mess. Its high time they build a dedicated bus station for private operators. I headed straight to Friends and got a ticket in the first Kallada G4 via Nagercoil -2045hrs was told as the scheduled departure time. In the meantime, the SRM B9R to Trivandrum left. I spent some time chatting with friends in Madiwala, visited the ATM and came back to Friends. By now my bus was parked on the roadside - the ever familiar Sabu was the cleaner for my bus! I got in to the bus and occupied my seat - #I4. I always prefer seats towards the back - for some reason love hearing the grunt of the 9 litre engine. The bus was getting loaded with luggage, and passengers were taking their sweet time to turn up. Unlike the past, there was no sign of the bus departing at the scheduled time - quite unusual for Friends Travels who were known for punctual departures. The bus finally started at 2110hrs. A movie was played soon after the bus took off. The driver was sane - he did not push the bus at all. We took a U-turn at St. Johns signal and continued towards Hosur. Even on the BETL, the bus was keeping sane speeds. Off late, I heard that G4 has been focusing on safer driving and they often end up reaching late. We stopped at Bommasandra for a pick-up - at 2135hrs. It took some time, and we left only at 2138hrs. I concentrated on the movie for sometime. There was no traffic at Attibele, and we reached Hosur at 2200hrs itself - we lost quite some time here in loading luggage and started again only at 2207hrs. I watched the movie till it got over. As soon as the movie got over, the cleaner came around and closed the rear screen. I slept off sometime around midnight. The driver was maintaining constant speed - the engine sounded very calm and relaxed. I had a fairly nice sleep. I vaguely remember seeing the bus running through a town somewhere in TN - but I was too sleepy to realise where we were. The bus stopped for a loo break somewhere on Madurai bypass at around 0335 - it was a short break lasting a couple of minutes. I slept off soon after we started from there. I slept quite well, and woke up only when the bus was approaching Nagercoil. We stopped outside the bus station in Vadassery, Nagercoil, at 0639. A couple of people got off, and a whole lot of luggage was unloaded - we started off again at 0640. I was a bit afaid if we'd make it to Trivandrum before 9, given the fact that its a high traffic two-lane road ahead. The bus stopped at Marthandam (0723) and Parassala (0738) to drop passengers and luggage. Once into Kerala, the road were surprisingly empty. Another video was being played on the TV now - it was a recent comedy skit. As we neared Trivandrum, we overtook the SRM B9R which left more than 30 minutes before us from Bangalore. I was finally dropped at Thampanoor, at 0823, just a little over 11 hours after we started from Bangalore! End notes: The bus was KA-01-AA-7723, from the first pair of Multi-Axles owned by Kallada G4. 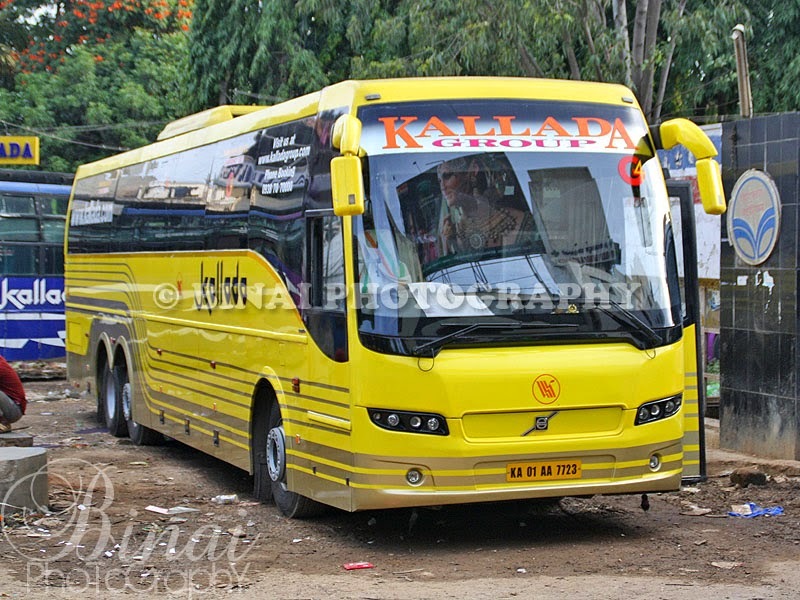 This yellow coloured bus had about 7.27 Lakh kms on the odo. The maintenance was above average - there were rattles from the suspension and the body did not seem well kept. The driving was great - no rash cuts or overspeeding - infact, the bus kept constant pace most of the time. The crew were well behaved and they did not show signs of hurry. Although the bus left late from Bangalore, we still reached Trivandrum in just 11h13m - reinforcing why a lot of passengers to Trivandrum have moved over to this route from the conventional route via Palakkad. Will I take this service again? Certainly! I'd love travelling by them again if I'd have to travel on this route again!